Max Harris was many things to many people: poet, journalist, critic, bookseller, publisher, newspaper columnist, husband, father … and much more. He can be thought of as one of the great catalysts of Australian letters. He sped up the reaction – he made things happen. His footprints are certainly all over the territory covered by this website: Malley, Nolan, Heide and Comment. It was Max to whom Ethel Malley sent her dead brother Ern’s poems; it was Max who in 1945 visited Glenrowan and Ned Kelly haunts with Nolan – to set off, or fuel, the passion in Nolan which led to the most famous series in Australian painting; it was Max, the Heide habitué, who published Angry Penguins with John Reed; and it was Max who contributed to A Comment and before whom, it is suggested, editor Cecily Crozier once disrobed to send him hurtling down the pathway from her home office to the relative safety of Bourke Rd. He was of course many things beyond this limited sphere – a man of letters at the forefront of his calling for nigh on 50 years until his death in 1995. I was pleased therefore to learn that Betty Snowden had decided to write his biography. 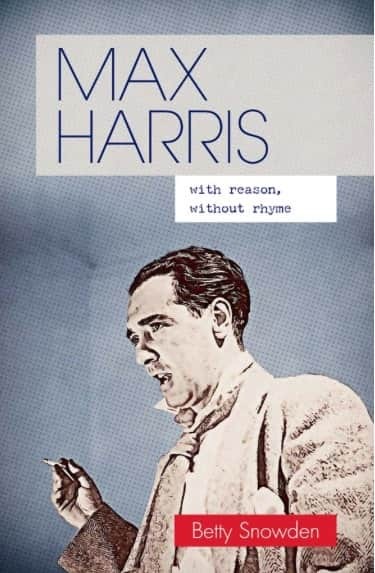 Max Harris: with reason, without rhyme is to be published this March 2015 by Australian Scholarly Publishing and featured at the Adelaide Writers Festival. Betty Snowden is well placed to write about Max Harris – indeed it has been a labour of love for her. As a student she worked for Harris in his Mary Martin Bookshop in Adelaide where she developed a liking and respect for the man. The biography has been prepared with help and assistance from Harris’ wife Von until her death last year, and his daughter Samela, and with full access to family history and records. Dr Snowden has a PhD in art history (UNSW) and has lectured in the subject in South Australian universities and art institutions. She worked as an art curator at the Australian War Memorial and has worked in Federal Government arts policy and programs. In 1995 she co-authored University of Adelaide Art collections and in 1998 was author of an exhibition catalogue of Adelaide artists Kathleen Sauerbier and Horace Trenerry. In 2013, Betty wrote a chapter on Max Harris in the Adelaide University publication Adelaide: a literary city. A review in aCOMMENT will follow publication. At last! We’ve been waiting a long time for this. No doubt it will be an arresting read. Whilst Betty Snowden’s title, given Harris’s emphatic support for free verse for which he was known to write prodigiously, is an apt one for her subject, I find it an irony in the sense that I think Harris’s best poem not only rhymes, but is a traditional styled bush ballad that is arguably better than many of Patterson’s serious ballads (I include Snowy River in that! Though not Clancy, which truly is a very good poem – streets, er, drovers’ tracks? – ahead of bland Snowy River.)! Harris’s poem? “The Tantanoola Tiger”. (Let’s face it, Patterson’s strength was humour – “The Man from Ironbark”, “Mulga Bill’s Bicycle”). The more reading I do about James McAuley and Max Harris, the more and more I’m finding the attraction of a ‘tantalising tiger’ of a challenge, in the true ‘Harrispirit’ of challenges: James McAuley was a Closet Modernist, Max Harris was a Closet Traditionalist!